Tamara developed a unique ‘entry-level’ property investment strategy to help them take back control of their financial futures. They just wanted to dig themselves out of the financial hole they were in, grow their wealth, replace their income and enjoy a lifestyle of freedom and abundance. Tamara James and Jason Carroll admit that buying into a café/bakery on the Gold Coast wasn’t the best decision they ever made. It was meant to be their ticket out of Sydney, but neither of them had any experience with running a café or a bakery, and they had their pastry and bakery chefs quit on them within two weeks of taking over. However it was the redevelopment of the host shopping complex that really derailed things. When they had initially signed the lease, there were plans to put in a new Aldi store, and “proposed” changes to the car park, which would have given them a seating area over looking the river. However, none of this was in writing, and the riverside seating never eventuated. What’s worse, the bakery was left enclosed in a dark end of the complex, and they lost half of their existing seating space. And just to rub salt into the wounds, the complex owners refused to reduce their rent. Around this time Jason lost his brother to cancer, and they lost all their energy and enthusiasm for making the business work – at the time it would have needed it most. 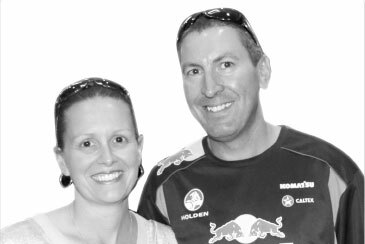 Deciding to cut their losses, Jason moved to Darwin to work at the mines as a camp-manager, two weeks on, one week off. Tamara moved back to Sydney and moved in with her mum. When Tamara became pregnant with twins, Jason needed to be with his family, and they all moved in with Tamara’s mother. However, with a large family in a small space they slowly started to drive each other crazy. Tamara’s parents then lent her the money to get into their own place in the Southern Highlands. It was a “total disaster zone”, with cigarette burns in the carpet and an old hydroponics set up in the cupboard, but it was a place they could call their own. With three children and no savings, Tamara and Jason needed a strategy to take them forward. Tamara enrolled in the Ultimate program, signing up for the payment plan and threw herself into her studies. Meticulously pouring over the materials (and cross checking everything Dymphna was saying with the internet! ), it took Tamara a full 12 months to develop her strategy. However, now she knew what she wanted, and the exact kind of deal she was after. Tamara decided to focus her search on towns with a minimum population of 10,000 people, and where you could still buy properties for under $100,000. Honing in on Deniliquin, NSW, she began to contact all the agents in the area. She put the work in and got to know her market. She learnt what properties typically rented for, and who they were rented to. She was pleased with what she found. Deniliquin was a tight rental market, with an active single-professional and contract-worker market. Deniliquin was also in line for a major infrastructure injection (finally approved in July last year). Tamara then found an advertisement from someone looking for a joint venture partner. It was a local farmer who had bought a property several years ago with the intention of building his own dream home. The property had a row of brick veneer units on one side and a derelict fibro-asbestos house on the other. A dual lot with a single title, the farmer was looking for a partner to help him build two new dwellings on his land. With approval for a subdivision between the existing units and the house pending, Tamara recognised a deal. Tamara and Jason offered to buy the units, so long as settlement was subject to approval of the strata title (which gave them an extra six months), and so long as they could access the property prior to settlement. The farmer agreed to their conditions, and they purchased the units for $95,000. Looking to move quickly on the renovations, Tamara and James had no money saved and had to get inventive. They took up an IKEA offer of 24-months interest free credit, and Jason kitted out all three units himself, including the plumbing and electricity. All up, the renovations cost them $25,000. After spending a total of $120,000 on the property, the units have had a recent valuation of $280,000, giving Tamara and Jason an equity uplift of $160,000. The units are currently rented at a total of $480 / week, and within the space of two years, Tamara and Jason have gone from a position of zero savings to over $16,000 pa in positive cash flow. Tamara and Jason’s story is proof that there are great opportunities out there, no matter what your starting position is. Tamara in particular stresses the importance of going back to the basics – go through everything step by step. Put in the time, do the research. There’s nothing to be gained by cutting corners when it comes to property. She also says you have to be patient. There are opportunities out there. Put time into your strategy, get clear about what you are looking for, and then just wait for it to come. These stories and the results in them were captured at a specific point in time. The real estate market and the investing strategies used to succeed are constantly changing. The achievements and results of these investors may have changed since these stories were recorded. Each of these investors engaged in in-depth training, coaching and mentoring to be able to achieve these results. Their results are not typical and should not be taken as a guarantee of the results you may achieve. Your personal results will be in-line with the training, education and hard work that you personally conduct.